This is my second post for today, scroll down for The Alley Way Stamps post. It's time for another Little Tangles Challenge, this time the theme is Happy Holidays. We had so many great entries in the last challenge, thanks to those who played along. I used the sets, Hey Cookie, Sweet Home and Little Bear for my card. 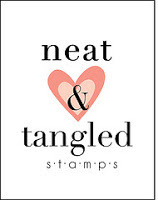 By playing along you have the chance to win one stamp set of your choice from Neat & Tangled stamps so make sure you link up your creation over on the Challenge Blog, you have until Sunday, December 16 at 11:59 EST. 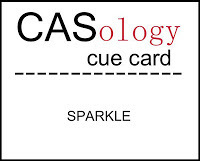 I am also going to put this card in the latest CAS-ology Challenge - Sparkle. I can't wait to see what you create this challenge! This is just as sweet as can be Tracy! love this cute little bear and the pretty snowy, glittery frame! this is just too cute..love all the fun glitter and that little bear is adorable.. So cute, I am LOVING the sparkle! He is adorable - I love how you've almost created a little snowglobe! Thanks so much for playing along with us at CASology this week! This card is sooooooooooo CA-UTE!!!!!!! That is all. Tracy I love your glitter circle, however do you do it so perfectly? Thank you so much for sharing with us this week at CASology! That bear is adorable in his glittery hat. Such a sweet card! Thanks for playing along with CASology this week!